Before installing update 3, I used to be able to export Storyline files to Word for translation. Now I get an error message (at least I think it's an error message, because there is no text that would give some indication as to the problem). No Word file is created. I haven't had any trouble myself using the Publish for Word feature since installing Update 3, but there have a been a few reports the last few days, though. Have you tried rebooting, or if necessary, running a quick repair? Peter, thanks for the suggestions. I rebooted, with no success. With deadlines looming, I'm not brave enough right now to try the repair option. I'll try that later. Looks like Christine provided you with some additional troubleshooting steps this morning. Outside of a repair (which will only repair your installation, not any saved or in-progress files), the only other thing I'd recommend is contacting our support team directly. They'll be able to gather more information from you and schedule a web conference, if necessary. Hello, I have successfully exported 4 different modules, but with the 5th one, I'm getting the same error box (there ain't no error message!). If you move the articulate window to the side of your screen there's another save as box appeared with 'save as' - Translation for.doc. If you click save, it disappears and there is now a translation word file, but it doesn't contain all of the data from the module. I wonder if it's something in one of the slides causing an issue. Have either of you had the opportunity to try the steps in the video below? If not, Clare, please submit a support case with us. We're trying to narrow down what's causing issues with this feature since the update was released. i didn't follow the video, but I did re-structure the module contents. I had one screen jumping out to 7 other screens that all jumped to each other (via hyperlinks). I tidied it up so that it was one screen jumping to 7 different layers instead. It then exported no problem. Thanks for the speedy response Christine. Hopefully either solution will help others confronted with this issue. Thanks so much for sharing this information. I'll be sure to pass this on to our QA team as well. In case someone else comes here and the solutions above didn't fix their problem, I found a solution that fixed my problem which may help someone else. I think it has something to do with a Clipboard problem. This was the only solution I found that worked after days of searching the Net. 1, Open the Internet Explorer. 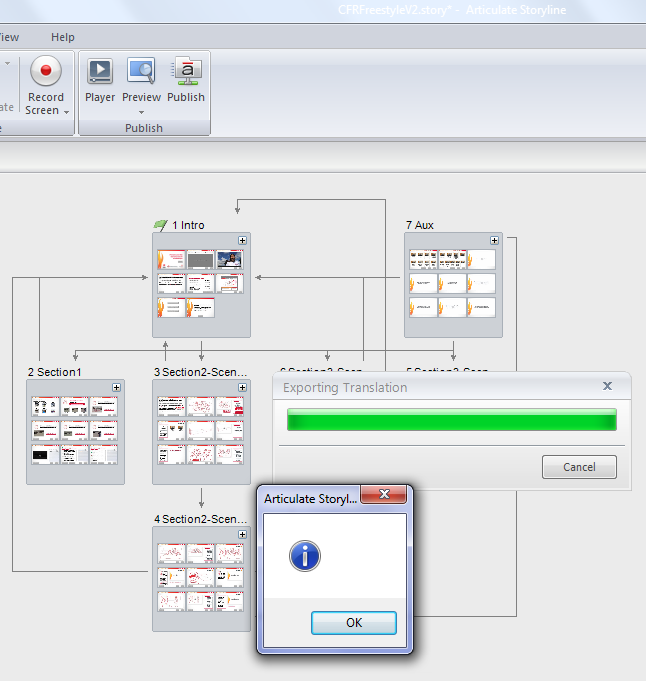 Exporting should now work perfectly in Articulate.